Just because McConnell’s insistence that Obama shouldn’t nominate a new Supreme Court justice is expected, that doesn’t make it normal. It’s outrageous. Leave it to Senator majority leader Mitch McConnell to defile Supreme Court Justice Antonin Scalia’s “originalist” constitutional legacy, when he’d barely been gone 24 hours. McConnell says President Obama can’t appoint Scalia’s successor; the choice must be left to “a new president,” although Obama has more than 11 months left in his term. Thus did McConnell seem to unilaterally rewrite the Constitution to strip a year from the president’s final term. All 43 presidents before him had four-year terms (unless they died in office or resigned, of course), but when it comes to arguably the president’s most important job, McConnell would limit Obama to three years. “The American people should have a voice in the selection of their next Supreme Court Justice,” McConnell said in a statement Saturday evening. “Therefore, this vacancy should not be filled until we have a new President.” Note to McConnell: A majority of the American people elected Barack Obama, twice. He is the first Democratic president to get more than 50 percent of the popular vote, twice, since Franklin Delano Roosevelt. It is in fact our right to have a voice in the selection of a justice. Obama is our voice. Even worse, so far mainstream journalists have mostly shrugged at McConnell’s declaration, as though it’s to be expected, just partisan politics as usual. Just because it hardly seems unusual, given DC polarization, that doesn’t make it normal. It’s outrageous. We can expect the GOP primary electorate to boo the facts. I hope the media don’t go along. The president has 11 months left in his last term, which is, as he said, plenty of time to nominate and get confirmed a new justice. 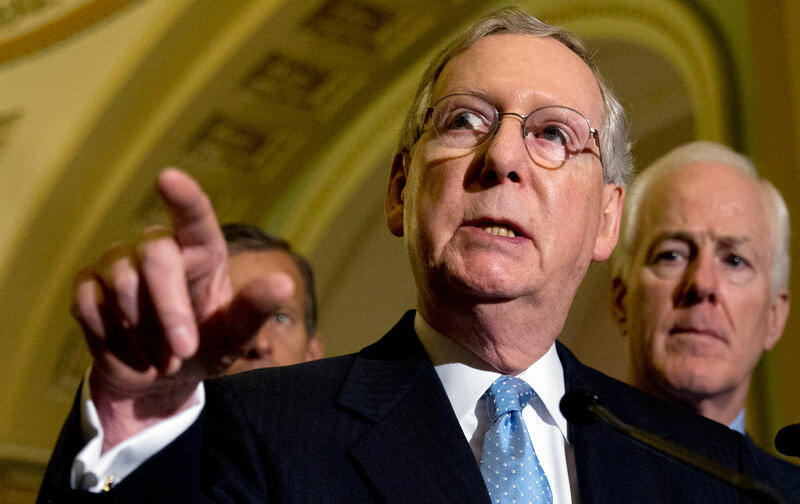 It will be tough getting anyone confirmed, given the fact that the right flank of the GOP Senate majority plays politics in a tougher way than the mainstream, but for McConnell to block a hearing and vote would take GOP obstruction to a new level. McConnell used to be part of the mainstream. He promised, when he took over as majority leader, that he would run the Senate in a way that showed that Republicans can “govern.” Part of governing is accepting the president’s right and responsibility to quickly fill Court vacancies and scheduling confirmation hearings promptly. Of course, it’s Republicans who have taken obstructionism to new levels under Obama. McConnell may be shameless, but he should be shamed over this latest maneuver. This article has been corrected to note that Obama is the first Democratic president to get more than 50 percent of the popular vote twice since FDR. Republicans Eisenhower and Reagan also received more than 50 percent of the popular vote twice.